1.Heat 3 tablespoons of the olive oil in a medium sauté pan over high heat. Add asparagus tips, broccoli,mushrooms, and garlic. Saute the vegetables until cooked but still firm ( about 5 minutes) Reduce heat to medium. Add zucchini, tomatoes and peas and cook another 3 minutes. Set aside and keep warm. 3.In a saucepan, add cream and reduce by half. Stir in the Parmesan and butter and turn the heat to low. 4. Saute the bay scallops in 2 tbs olive oil. Do not overcook! 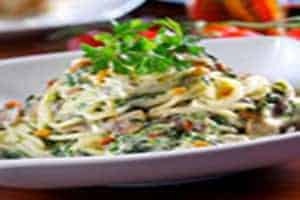 5.Toss the vegetables, cooked pasta, scallops and cream sauce. Garnish each plate with toasted pine nuts, a pinch of basil, and freshly grated Parmesan, with salt and pepper to taste.